If you’re looking for a good Star Trek spoof — and a decidedly un-PC one at that — then Steven Erikson has got you covered. Wrath of Betty is the second book chronicling the voyages of the A.S.F. starship Willful Child. Its ongoing mission: to make you laugh, and maybe offend some delicate sensibilities along the way. I gotta say though, “BETTYYYYYYYYYYYYYYYYYYYYY!!!! !” doesn’t quite have the same ring to it. I know how you love your SF! Hope you love it! Ooh nice! That’s totally new to me! Hope you love it once you read it! I remember when you reviewed the first book, and thinking I need to check out this series. And I’m still interested! I’m more of a STtNG fan, but I do love the utter cheesiness of the original. Sounds like fun! I do like Star Trek. Such a funny title, too! Of course, I think I have a book or two by Erickson. I’ll have to see what they are–and perhaps read one of them and look for the first book in this series. Wow, he’s found time for a second spoof, has he? I enjoyed the first one, but I prefer his Malazan fantasies. Agree with Maddalena’s comment. Sounds like the author is enjoying this series so it usually makes for good reading. A haven’t read any Star Trek or Star Wars which always makes me feel sort of guilty – I keep saying one day though! Never say never. 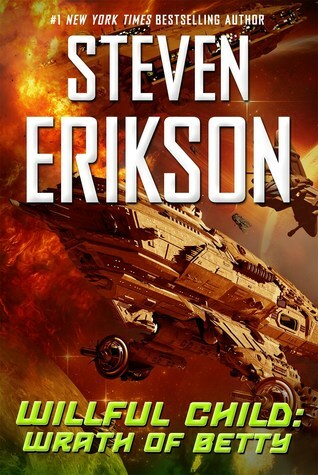 I hear Erikson is a big Star Trek fan! I wouldn’t have expected him to write something like this either, but he clearly he was inspired by his life long love for the series.